Present were: Ron Williams, Allen Palmer, Bill Flora, Glenn Lea, Bob Feretich, Joe Preston, Stan Paddock, Robert Garner, and Ed Thelen. We reassembled the -12 volt power supply. Frank King had replaced 2 big pass transistors that he thought suspect. And we had checked the two rectifiers in the full wave circuit (both good). Ed tested it at 0, 10 and 20 amps The power supply had less than 0.1 volt p-p ripple (at the expected 100 Hz)! That - 12 volt power supply is, and I contend was, good. So we put it back into the 1401 and connected up the scope to check the now suspect -6 Volt supply which also supplies a reference the just checked -12 volt supply. Everything just fine !?! How strange!! There is no way Frank's two suspect pass transistors could have caused the symptoms we observed last Wednesday !! Really !! The buttons on the display appear and act similar to the actual 729 buttons. This is a "G-Job" - not related to the 1401 project - Bob Erickson purchased an old "frozen" (main shaft stuck) teletype (TTY), and in between fixing the 077 collator and the 513 summary punch, has been puttering with his TTY. Today things are looking up. Judith assisting. And this keyboard works - Hey - Look at that - Transmit and receive Work !!! Melvyn Maltz of London, the U.K. came by. He mentioned that he has been in contact with Robert Garner and has given many unit record and 1401 manuals to CHM via Allison Akbay. He started programming 1401s at the age of 16 in 1966 !! Well, we have to take care of a guy like that !! So we ran off a BIGPRINT souvenir with his name in BIG PRINT ;-)) and introduced him around. Melvyn mentioned that he liked to do factorials and Pi - so I ran my Pi to 500 places program for him - it takes about 3.5 minutes. He seemed to have memorized the first 30 places and was satisfied ;-)) He plans to come back next Wednesday morning to see Robert Garner. The arrival of the second Babbage Difference Engine #2 from the Science Museum (London) distracted Ed, but all others seemed to "keep the faith". Plywood flooring is not an elegant solution, but this room is scheduled to be demolished in 18 months. The 1401 system and flooring will be moved to another area of the Museum. Where were we? Last week the UPS got removed and some metal brackets got removed. And someone brought in some plywood. 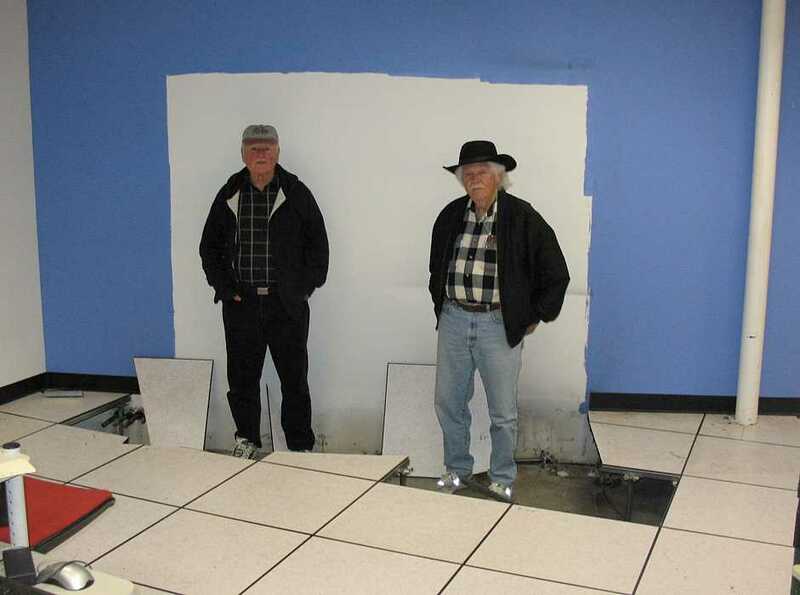 Frank King and Ron Williams are examining the options - The plywood is down. 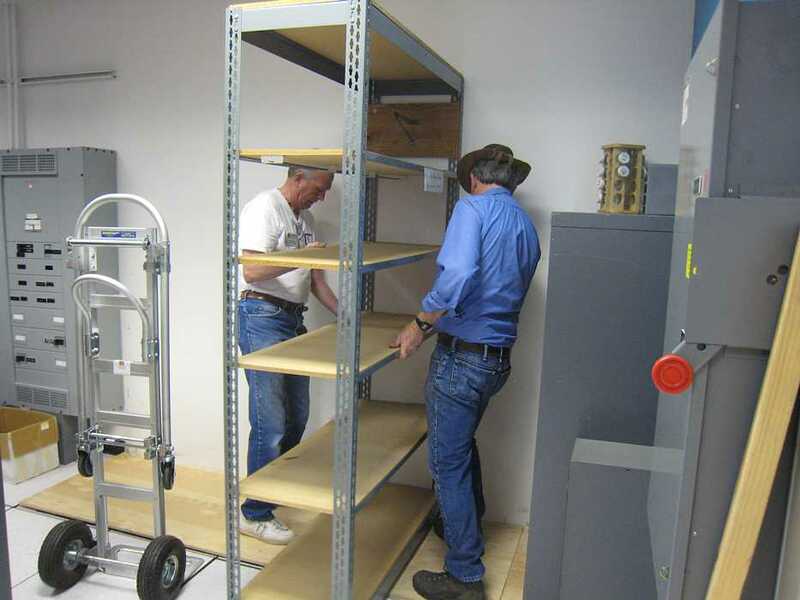 Glen Lea and Stan Paddock are moving racks and cabinets into this crowded location to free up more open space. 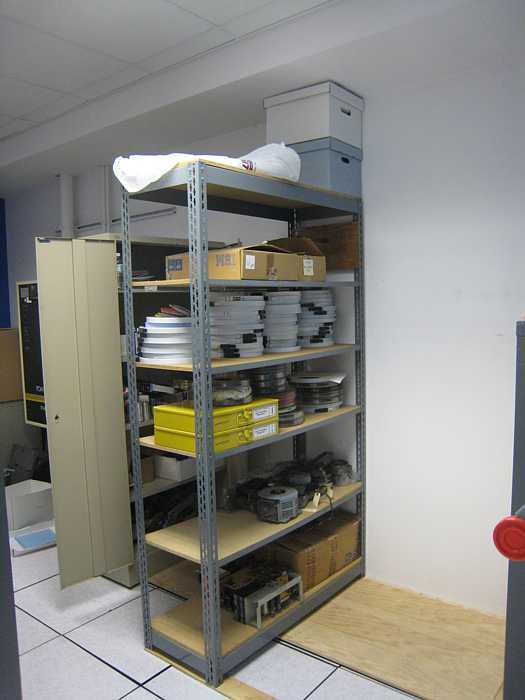 The rack (right) and contents will be moved next week. Today at the CHM, we tested the web application GUI integrated with the 729 Tape Drive Emulator drivers. Again there were Eclipse problems. For some reason, the Ant build process started including two copies of the web application libraries. The result was a malformed .war file.Removing the "lib" parameter from the "war" step fixed the problem, but the "lib" parameter was there from the beginning. I don't know why it started causing trouble today. Using the Internet Explorer and the GUI web pages, we mapped drive #1 to a blank tape. Pressed the "Load Rewind" button on the web console. Pressed the "Start" button on the web console. Placed Ron's program deck in the card reader and booted it. The program ran to completion. We saw lots of lights flashing on the Emulator LED panel. Pressed the "Reset" button on the web console. Pressed the "Unload" button on the web console and was prompted by Internet Explorer to Open or Save the download file. I opened the file (in Microsoft Notepad). It contained the correct result. All converted to from BCD to ASCII. Using Internet Explorer and the GUI web pages, we mapped drive #1 to Van's program residing on my hard drive. Pressed the "Tape Load" button on the 1401 console. The 1401 read one tape record and turned on some check lights. I don't know why. One of the check lights that were on was the "Punch" check light. Memory was corrupted. Where "+" is a BCD C-B-A and "|" is a A-8-2. So, this was the first successful test of the entire 729 emulation system. I still have some tweaks, bells, and whistles to add, but "management" needs to think through how the Emulator will be used. Running 6-drive sorts, Autocoder and Fortran-II compiles is now a possibility. Students could beam (via wireless network) their programs from their notebook computers to the 1401 for execution. Results could be beamed back to the students' computers. The contents of "artifact 7-track magnetic tapes" could be copied to modern media. And some railing was removed. Present were: Ron Williams, Frank King, Glenn Lea, Judith Haemmerle, Joe Preston, Stan Paddock, Ron Crane, Robert Garner, and Ed Thelen. Judith was mostly taking a Babbage Difference Engine from Tim Robinson with self selected docents. Frank and Robert were busy tying up loose ends for their trip to Connecticut this Saturday to support the packing and move of our "new" 1401 system. There have been many e-mails clarifying the many details of the riggers, movers, CHM internal move, ... The system is expected to arrive at CHM about May 6th. 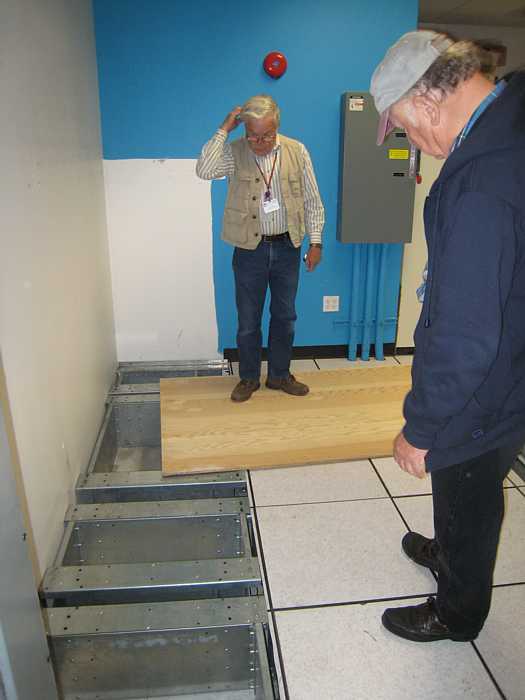 Stan had many floor tiles up trying to trace and identify the many underfloor flexible electrical conduits and boxes. 2. Removed jagged floor tiles where Liebert was. 3. Removed pedestals tops that will not be needed. Unable to remove the base of the pedestals without a jack hammer. D. How many runners between pedestals will be required. E. Tossed out cables and trash from under the floor. I asked Ron today what type of power was required for the CT 1401. He gave me the power requirement and the connector type. Guess what I found under the floor. The right connector and the right power. I will get in touch with RFI and see if I can get the parts before Wednesday. The attached Power Point file defines the work. I am not sure the work can be done in one day. 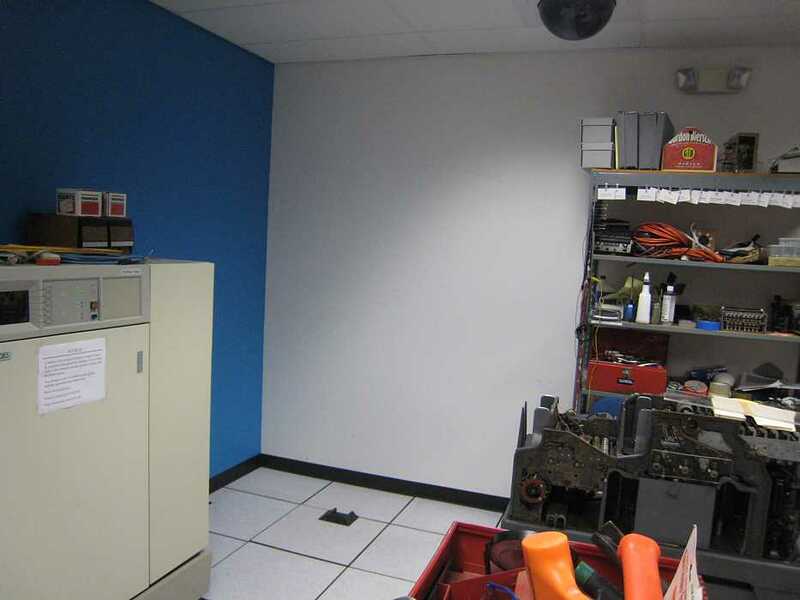 The walls in the 1401 room were painted AFTER the Liebert was installed. We now have a big white patch where the Liebert used to be. I am working on filling in the floor tiles. If you could supply the paint, roller and brush, we can do the painting. They both look guilty !! Pictures from Robert Garner, Frank King went as moving consultant. Both helped pack small items Sunday. Frank arrived at Robert's house at 5:15 am Saturday morning, then off to SFO for a nonstop to JFK. We rented an SUV and drove straight to the Stamford U-Haul for 36 blankets and shrink wrap, checked into the renovated Holiday Inn, and in the evening strolled to Mitchell's Fish Market at the Stamford Town Center. Next morning 9 am we arrived at Buzz Bellefleur's Darien residence and got right to work with Scott and his brother Ray until about 1 pm lunch break, moving and cleaning out much accumulated stuff and old shelving from the basement, including several Altair hobby systems. With overcast and threatening skies (and rain forecast for Monday's rigging removal), Frank battened down for transport the 1403, all six 729's capstan mechanisms, removed the 1402 card feed tray, and then we steadfastly wrapped units in blankets and shrink wrap. I dashed to Orchard Supply to procure more shrink wrap and plastic sheet (two cable boxes in lawn). Working straight until about 9:30 pm, with some units remaining to be wrapped, but figuring we could stay ahead of the riggers the next day, we called it quits while Scott found a late-night friendly dinner spot -- Rory's on historic Boston Post Road. That night, neither Frank nor I slept well: highway noise, rain, and mental gymnastics on extracting four tons of computer from a cramped basement undamaged and dry. We reported to Buzz's residence at 7:15 am just as the riggers from "A-Quick Pick Crane" arrived in the rain. The foreman, Jimmy, maneuvered the 30-ton crane and second flat-bed truck in the back of the driveway, against the small garage and under a large tree and efficiently setup camp. They began the extraction process with removing the 729 tape units through the slanted bilco storm doors: first placing a thick plastic sheet on top of units, laid them on their left side on a cart, pushed/pulled the cart up the 5-step stair to the lawn, lassoed 'em with 2-inch webbing, lifted 'em up and over the yard with the boom, carefully deposited 'em on the flat bed, and finally re-covered the units together under another sheet. All of this happened in the cool nonstop rain showers. Next to be removed were the wider/shorter units through the rear, short door onto the back yard: the two 1406's, 1402, 088 collator, and the two 1403 printers. The riggers used a 1" steel cable wrapped around a massive tree trunk (fortuitously positioned) pulled tight via a substantial hand-operated winch to slowly bring these units up a ramp and out through the small door opening onto the lawn, while also crouching under the overhead deck. This was relatively straightforward, but watching each unit "fly" through the air was, although disconcerting, somehow reassuring. 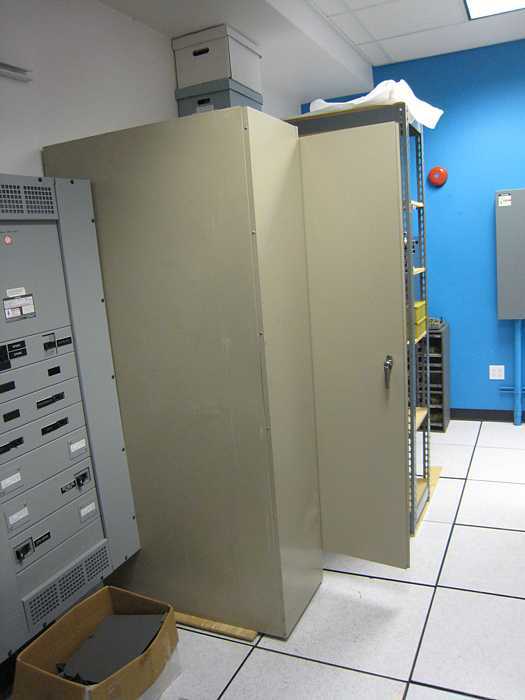 The big challenge was saved for last: the 1-ton 1401 CPU. Because it would not squeeze though the door with cables resting on top, the riggers elected to lace them together into a bundle and then several of us escorted the long heavy "bridal chain" (more like a boa snake) behind the CPU as it was maneuvered out the door. Since the CPU had to be kept horizontal so as not to hit the overhead deck on the way out (with only 1/4" clearance to top door jam), the rear hydraulic lifter was incrementally raised as it progressed, and maxed out just as the CPU inched out the door, with the rigging team cheering its new-found freedom. It was placed on the crane flat bed itself, not on the flat-bed truck with the other units. After repackaging all their paraphernalia, congratulating and paying them for a great job professionally done, A-Quick Pick Crane departed around 2:30 pm to their environmentally controlled warehouse in Sheldon. Back in the house, Frank and I loaded up the software tapes into a sturdy box, said a heartfelt good-bye to Buzz and Scott, thanked them for everything, and then headed for Stacy's to UPS the box of tapes to Paul Pierce in Seattle, who confirmed he'll recover the bits via his analog tape acquisition setup. As the truck's flat-bed was wet, McCollister's agreed to pick up our cardboard boxes the next day, Tuesday. Although Frank and I were not present, they arrived about 11 am, sited their dedicated van (now filled with our 1401) on the very busy West Ave out front, loaded up the boxes, and, with Scott's advice "to drive carefully," departed for California. That night, in the pouring rain, we tried to find our next hotel, the Hampton Inn in Danbury, CT. Luckily diner was available across the parking lot. On Tuesday, of course now a sunny day, Frank and I visited the IBM Archives, in an decommissioned cleanroom in Fishkill, NY, guests of generous hosts Paul Lasewicz, IBM's head archivist, and Dawn Stanford. Paul gave us a tour of their extensive hardware collection, including impressive Sage consoles, 1960's mainframes, part of Dave Bennett's storage collection, transistor 608, a poor-looking 1401, unit record equipment back to the 1920's in great shape, very old ITR clocks, etc.. (I'll post pics later.) We spent the afternoon looking through aisles of boxes for those labeled "Endicott," hoping to find engineering docs related to the 1401. I was very lucky to find a complete set of all of Fran Underwood memos(! ), in with older unit record manuals, written as he and team were designing the 407 follow-on he called SPACE (internal project name for what became the 1401). On Weds, Frank and I visited the sleek IBM Archive office in Somers, NY, where in a beautiful wood-paneled room, with unit-record equipment and new stuff on display, we examined 1401 materials in four acid-free boxes. The real treasure trove was the original 1401 marketing materials, especially the staged system marketing photographs. Dawn will be scanning items in the coming months, while I have pics of the marketing materials and copies of the B&W photographs. We dashed out at 11:15 am, got lost in the meandering highway maze in NY city, and made our flight to touch down in SFO at 6:30 pm. All in all, an educational and successful trip! Present were Ron Williams, Bob Erickson, Ron Crane, Joe Preston, Judith Haemmerle, Stan Paddock, Stan Paddock, and Ed Thelen. That print unit on the 026 key punch is still giving Joe fits - print units are known to be a real bear ! !